I feel like, because it’s hard to find an avid fashion blogger my age in Korea, lots of people tend to think I must be an incredibly amazing blogger. The thing is, whether I’m interviewing America’s Next Top Model models, hosting collaboration projects, or talking to magazine editors, I slip up a lot. And I mean A LOT. For example, the other day I was supposed to be interviewing Pixie Lott, but I FELL ASLEEP AND MISSED IT. Yep, you read that correctly. I just literally could not attend the online webinar BECAUSE I WAS FRIGGIN SLEEPING. IN MY BED. And this is THE PIXIE LOTT we’re talking ’bout here. So here’s what happened. Recently I found a blogger community newsletter in my heap of emails. 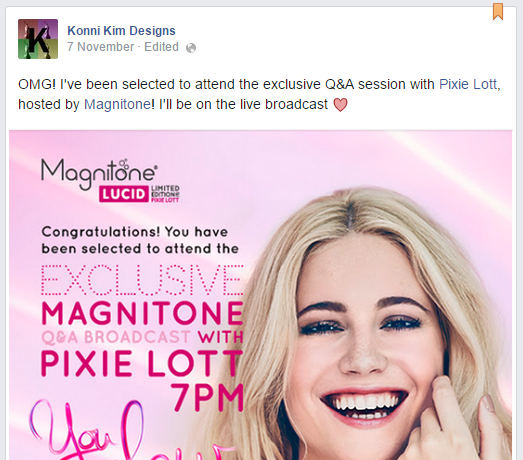 There was a link to attend the online Q&A session with Pixie Lott, hosted by the brand Magnitone. Of course, being a Pixie Lott fan, I applied. As I waited in anxiety and anticipation, I received an email informing me that I’d made it; that I’d been chosen to participate in the exclusive live webinar session with Pixie Lott. At that point I could practically imagine the looks of utter shock and admiration on people’s faces when they found out about it. 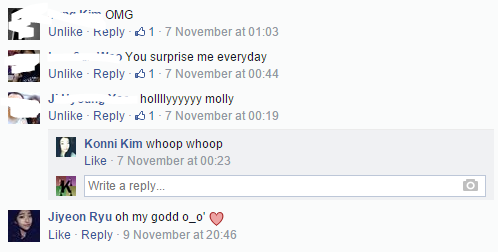 Tingling with excitement, I posted this on facebook. And people were in awe, as I’d expected. I was too busy basking in the glory of being the first person among my friends to be able to exclusively interview someone as famous as Pixie Lott, that at first I did not realize that the Q&A session was in three hours. I was probably the last person put on the list. I honestly freaked out when I read the words ‘Reminder: the exclusive Q&A session with Pixie Lott is in three hours(4AM)!’ in my business inbox. I’d been studying at school until 10PM that day, I was tired, I needed a shower and a nice few hours of sound sleep. A short internal conflict occurred in my head-should I stay up until 4AM and talk to Pixie Lott, or should I just forget it and get some sleep? After a split second, I decided that the former would definitely have to happen, because, who knows, this could be my big break, right? You never know in the blogging world. So I drank my coffee, washed my face, and sat at my desk to prepare myself for the painful three hours of cruel, wearisome waiting in anticipation and irritation from severe sleep deprivation that were to come. I did everything to keep myself awake. After all, I couldn’t let my readers(you guys) down, and my friends were counting on me to nail this Q&A session and tell them all about it. AND THEN guess what I did. I got a little drowsy, so I thought, ‘just 5 minutes…yes…I’ll just close my eyes for just, just…5 minutes’, and then I WENT TO MY BED. Now there’s one thing you need to know about my bed-it’s the coziest, softest, most sleep-inducing patch of space on planet Earth. It’s truly a fine bed. And as I lay down, I kept telling myself, ‘Everything will be fine… I’m sure I’ll get up before 4…’ BUT NO. NO, NO, NO. JUST. NO. I DID NOT get up before 4. In fact I did not get up at all until the clock struck 7:10 AM. I opened my eyes, got straight up, stared at the clock, rubbed my eyes, then stared some more. The clock definitely said 7:10. I panicked for a while, even thinking, ‘well..well…maybe the webinar isn’t over! Maybe I’ll still get to talk to Pixie…’ But I regained my logical thinking skills, muttered some bad language about how I was such an idiot(WHICH I WAS), and went back to bed, because, you know, maybe it was just a big bad dream(which it wasn’t). And that’s my story of how I almost, just almost, interviewed Pixie Lott. My friends were totally bummed when I told them, of course. My mother just laughed at me. I was mad at myself for a while but then, oh well. This post was supposed to be about my almost-happened interview with Pixie Lott, but since it didn’t happen, here’s my reflection on the whole situation. Thinking back now, firstly, I’m beginning to realize it’s not that big of a deal. #YOLO. Just kidding. That hashtag is overused. But seriously though, take that in for a moment-You Only Live Once. If I only live once, I wanna make mistakes, especially while I’m still young. I’m only human. There’s no point dwelling on the past and getting angry all over again. It’s a waste of precious time. Secondly, while I do need to forgive myself and move on, I also need to learn from my mistakes. Me missing the interview chance was totally my fault. I cannot blame anyone else for it since it was just the result of me being an idiot. Blogging and tackling school work all at once is turning out to be harder than I thought, and I do struggle. However, since I made the conscious choice to continue on with my blogging career, I need to start being more responsible for it. I need to improve my time management, primarily. I also need to focus on the essence of my blogging. I always told myself that I didn’t want to be the type of fashion blogger that just posts photos of Chanel and Givenchy, accepting unhealthy fashion ideals and passing selling them on to the public as if those standards are the ultimate rules of fashion, conforming to trends without critical thinking. However, these days I often find myself thirsty for opportunities with famous, popular people that might give me my ‘big break’. It’s ridiculous, I know. I need to focus on my writing; my posts, which express my true colours and insights, and stop floating above my conscience, swimming on the edge of glamour and undeserved fame. This is my confession and promise to you guys that from now on I’ll remind myself each day of why I’m staying up this late(or NOT staying up, in the case of how my Pixie Lott interview went down, haha) and take myself to the beginning whenever I feel like I’m becoming too obsessed with the shallow glittery stuff. Because I believe I can make a positive change and contribute to the development of self-expression. ← Interview with Lenox Tillman from America’s Next Top Model!